Posted on Wednesday, November 6th, 2013 at 9:51 am. Boxing History: November 5, 1994 George Foreman KO 10 Michael Moorer, Las Vegas. Regains World Heavyweight Title. At 45, Foreman is the oldest to ever win a heavyweight title fight. George Edward Foreman (nicknamed “Big George”) (born January 10, 1949) is a retired American professional boxer, former two-time World Heavyweight Champion, Olympic gold medalist, ordained Baptist minister, author, and entrepreneur. 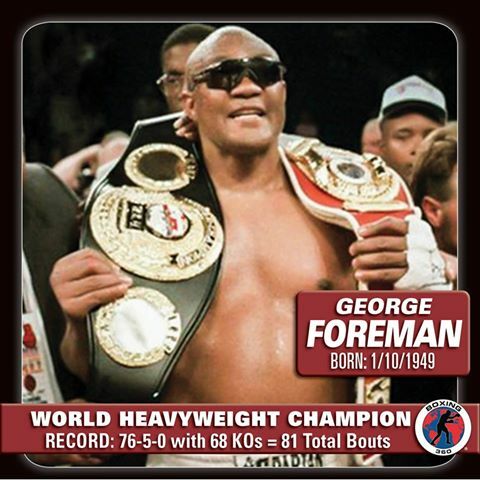 Foreman’s title challenge against Moorer took place on November 5 in Las Vegas, Nevada, with Foreman wearing the same red trunks he had worn in his title loss to Ali 20 years earlier. This time, however, Foreman was a substantial underdog. For nine rounds, Moorer easily outboxed him, hitting and moving away, while Foreman chugged forward, seemingly unable to “pull the trigger” on his punches. Entering the tenth round, Foreman was trailing on all scorecards. 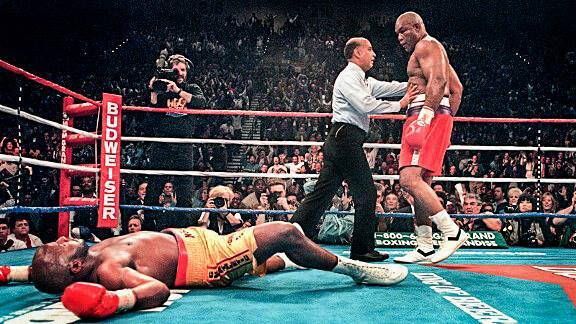 However, Foreman launched a comeback in the tenth round and hit Moorer with a number of punches. Then a short right hand caught Moorer on the tip of his chin, gashing open his bottom lip and he collapsed to the canvas. He lay flat on his back as the referee counted him out. Received The Ring Progress of the Year Award for 1970. Received The Ring Fighter of the Year Award for 1973 and 1976. Received The Ring Comeback of the Year Award for 1994. Named the Fourth Greatest Heavyweight of All-Time by The Ring in 1998. Named the Ninth Greatest Punchers of All-Time by The Ring in 2003.